Fire has always been a mystical entity to man. Even today, scientists have a difficult time explaining what fire is, while people around the planet stare into the flames and see things that dreams are made of. The glowing, dancing orange tongues of flame are hypnotizing. No wonder flames have found there way into ritual and traditions throughout the world, from modest candles to raging bonfires. In the Unites States, bonfires might be lit during homecoming for a local sports team, or in New England for the Fourth of July, or perhaps along the levees of the Mississippi in southern Louisiana to light the way of Papa Noel’s return at Christmas. 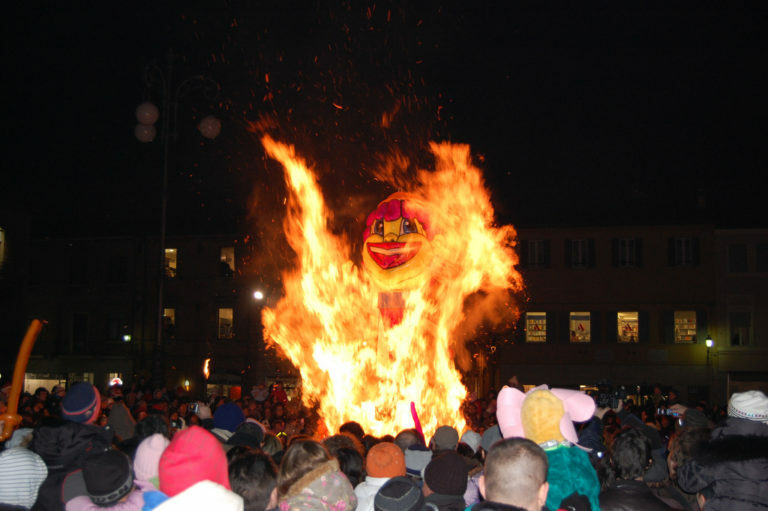 But in Italy, although often related to a particular saint’s day, bonfires have more pagan roots and meanings. Some are burned in early January to signify the end of one year and the beginning of another, while others burn during Mardi Gras (for Carnevale season) or during Lent. 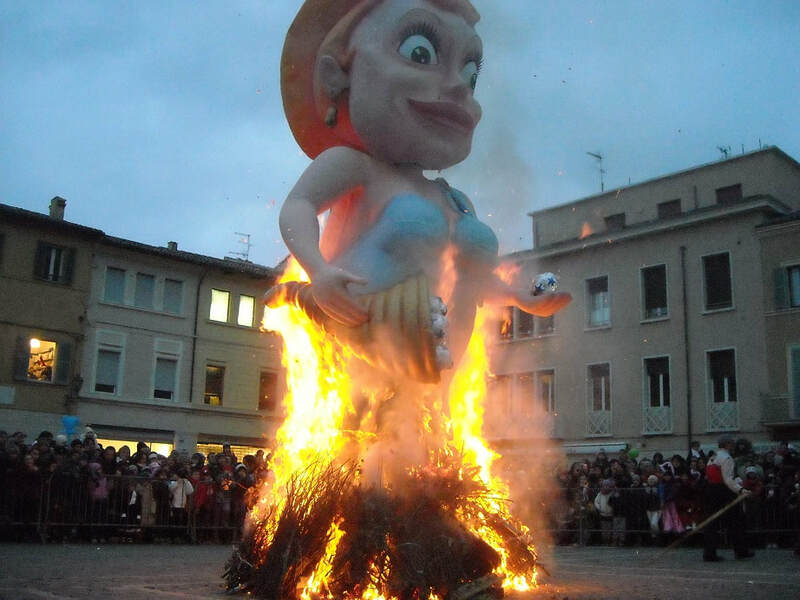 In Italy, the ritual of flames is evident in the many Bonfire Festivals, or Festa dei Falò. In Northeast Italy, the celebrations of Panevin (“bread and wine”), Foghera or Pignarul are held in the twilight of Epiphany’s eve (5 January). 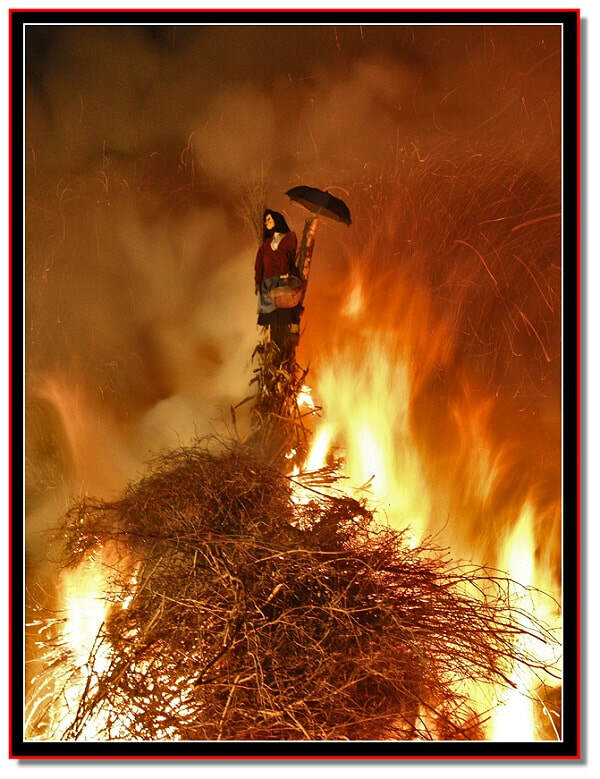 A straw witch dressed with old clothes, symbolizing the past year, is placed on a bonfire and burned to ashes. The direction of the smoke indicates whether the new year is going to be good or bad. 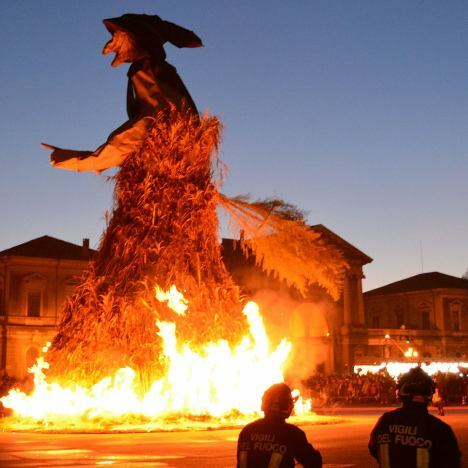 In Northen Italy, La Vecchia (“the old woman”) is a huge wicker-woman effigy built of wood and vines and burned once a year as part of town festivals. As depicted in the film Amarcord by Federico Fellini, it has a more pagan-Christian connotation and is burned on Mid-Lent Thursday. 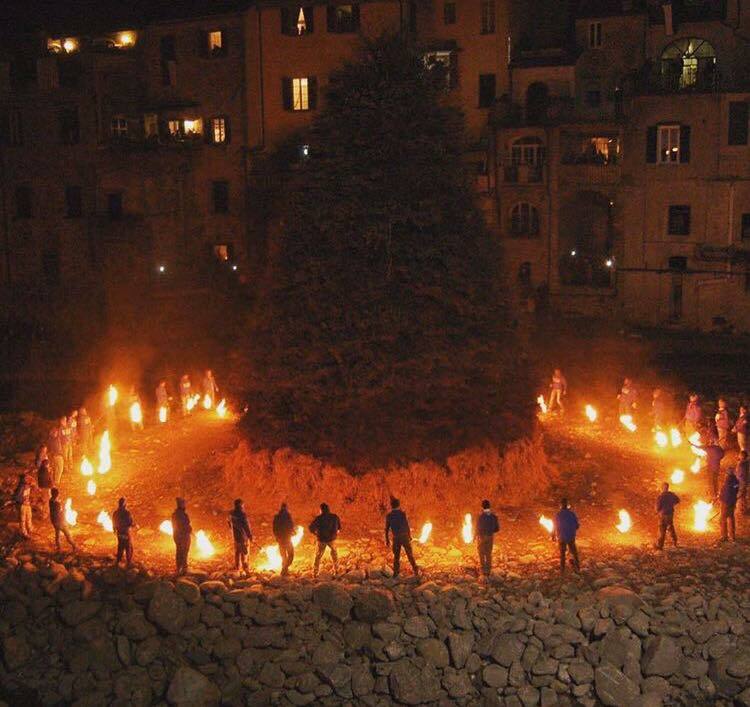 In Abbadia San Salvatore, a village in the south of Tuscany, bonfires called Fiaccole flare up to 25 feet high, and are burned during Christmas Eve to warm up those waiting for midnight. 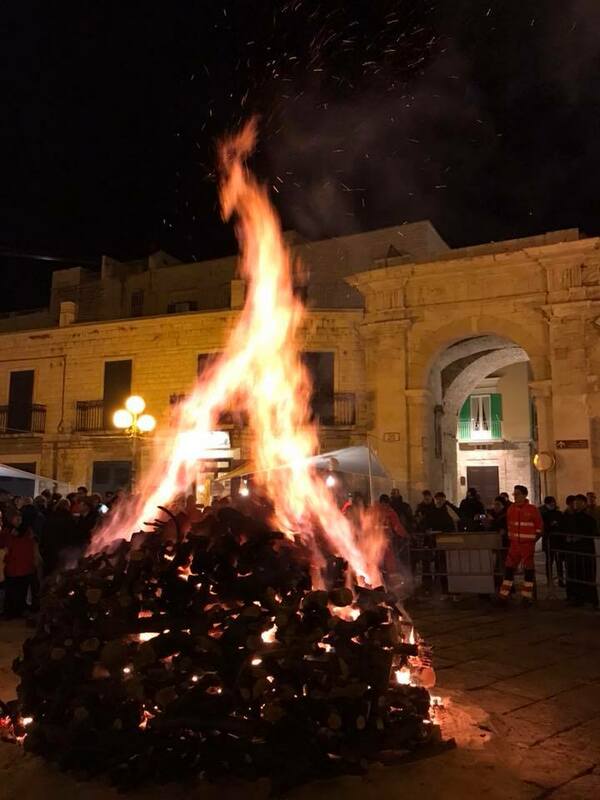 In Southern Italy, traditionally bonfires are lit on the nights of the 16th and 17th of January, thought to be the darkest and longest nights of the year. The celebration is also linked to the cult of Saint Anthony the Great. 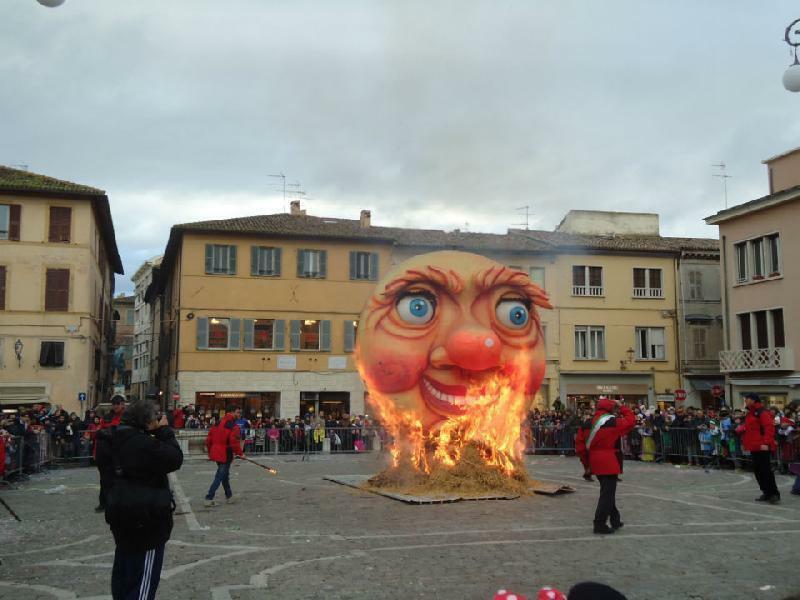 In Tuscany, there are many fire festivals during the winter months with ancient origins. These sagre and their fires are meant to draw attention from the “Sun God,” to conjure up its presence–and warmth–during the dark, cold months. As Christianity grew in ancient times, the pagan rituals were converted to celebrate various saints or holidays of the Catholic religion. In the town of Fano, where marches run from early February to Mardi Gras, they hold the Carnivale di Fano, one of the oldest–and sweetest–carnivals in Italy. During the festivities you can watch and take part in battle fought with chocolates and candy! Hundreds of pounds of sweets, caramels and chocolates are showered from parade floats onto the crowds of spectators, who then throw them back or at each other. At the end of the month-long festival, there is the Rogo del Pupo, the Bonfire of the Baby Doll, a huge paper mache doll (a different one is designed and built each year). “Fiaccolata di Abbadia San Salvatore” – Torchlight of Abbadia San Salvatore on December 24. Bonfires, music and food stalls offer sweets and mulled wine.